The author has pulled the points of wisdom from the greatest of all works authored by the Greatest of all Authors. I’m referring, of course, to the Holy Bible, dictated to human writers by the Lord, Himself. One simply cannot go wrong under such direction. Thus, Jonathan’s is a book that I can wholeheartedly recommend. But I also think it is one of the truly unique concepts I’ve come across for helping us avoid the pitfalls of life as described above. Shipwrecked! 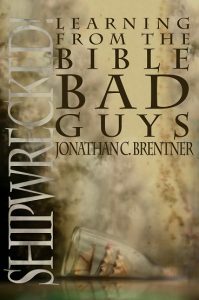 : Learning from the Bible Bad Guys is a title perfectly describing that unique concept. The author uses the mistakes made by some of biblical history’s most notorious rebels against God’s prescription for living. He expertly weaves the narrative to present us with a colorful tapestry of how we shouldn’t conduct our lives. The reverse way of life to that conducted by the Bible’s “bad guys”—the correct way—as we proceed through our given years, thus is almost supernaturally, I think, etched into the reader’s realization. As I say, Jonathan Brentner, a former pastor, has composed a unique and effective volume for how to avoid many pitfalls into which we are prone to plunge and, of course, later regret. The emphasis is different in each case the author presents. A key theme of the book, however, always involves encouraging the reader to learn from the mistakes of the characters. Exhortation is geared toward encouraging us to apply Bible precepts rather than give into negative emotions and sinful desires. A few examples of Brentner’s Bible “bad guys” and their choosing the wrong way are demonstrated in the following. With Saul, we learn the importance of trusting God rather than religious behavior. In the second chapter, the author contrasts Saul’s behavior with that of Saul’s son Jonathan to show differing results that come from seeking to glorify God rather than self. Absalom was truly a ticking time bomb. His anger and bitterness toward his dad after Amnon raped Absalon’s sister, Tamar, festered inside him for many years. With Absalom, Brentner stresses the importance of dealing with anger quickly before it turns into a root of bitterness and affects those around us. With King Asa, Brentner explores the danger of forgetfulness in the matter of the importance of remembering all that God has done for us. As Christians who have been believers from an early age, it’s so easy to forget the wonder of the cross and all the answered prayers over the years. Cain shows us how one can be close to the Lord and not really know Him. In this chapter, Jonathan Brentner emphasizes the Gospel. Cain was not an atheist; he could never deny God’s existence. He even had arguments with him. But still, he never came to truly know the Lord or trust Him. John Mark shows us that failure does not have to be the final chapter in our lives. The author says he loved writing this chapter because of how it illustrates that God gives us chances after our failures. Despite the young man’s initial failure that led Paul to reject him, John Mark later became someone useful to the apostle and was used mightily by the Lord later in life. These and many, many more illustrations make this a book that will enhance anyone’s life who applies these Bible truths to his or her spiritual heart. The author says his desire in the book is to draw people away from merely relying upon worldly principles and religious behavior. He wishes to, instead, point them toward a true and vital walk with the Lord.